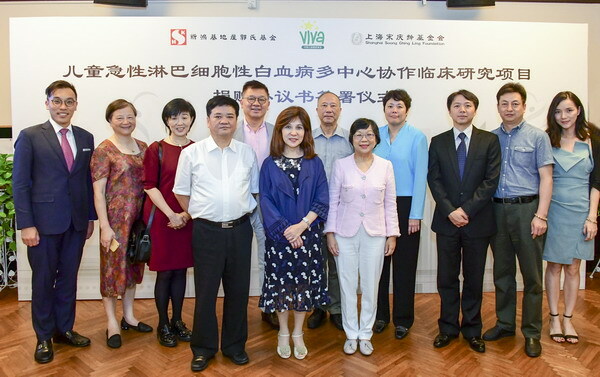 The clinical research project on childhood acute lymphoblastic leukemia, established by the Viva China Children's Cancer Foundation and the Shanghai Soong Ching Ling Foundation, has recently received HK $2.5 million yuan from Sun Hung Kai Properties – Kwok’s Foundation Limited. The signing ceremony of the donation agreement was held at Former Residence of Soong’s Family on August 17. Present at the signing ceremony were Amy Y. Y. Kwok, executive director of Sun Hung Kai Properties - Kwok’s Foundation Limited, Jennifer Yeo, chairman, VIVA China Children’s Cancer Foundation, Jia Yong, acting secretary general, Shanghai Soong Ching Ling Foundation and Tang Jingyan, executive director of the clinical research project, Shanghai Children’s Medical Center. A collaborative clinical research project on childhood acute lymphoblastic leukemia was attended by 20 hospitals in China, including the Prince Wales Hospital in Hong Kong, and collaborated by St. Jude Children's Research Hospital in the United States. The 20 hospitals will create collected data and collected samples, as well as continuous sharing platforms to improve the survival rate of Chinese children with leukemia and its aim is to increase the cure rate of cancer in Chinese children from 40-60% to more than 90%. Viva China was established in 2014 and the clinical study on childhood acute lymphoblastic leukemia is the first tripartite cooperation project. As of June 2018, the three-year survival rate and three-year disease-free survival rate of 4,955 children who participated in the project were 93.8% and 85.9%, achieving encouraging results.